My latest endeavor was cooking Beef Short Ribs. The short rib is literally just the rib from a cow. They are usually sold individually, as they tend to weigh almost a pound each. The rib naturally has more fat and connective tissue than a steak, and needs to be cooked using the “low and slow” method, meaning low heat for a long time. I purchased 4 beef short ribs from Fresh Market (approximately 3.5 pounds in weight). I used my steak rub to coat the non-bone side of the rib. Working in batches, I then seared the ribs on all four sides in a dutch oven. Can you make this dish without a dutch oven? Yes, however I highly recommend it. Once all the ribs were seared I removed them from the dutch oven and proceeded to saute some onions, carrots, celery and garlic. Once the vegetables were softened I added red wine, and then chicken stock. Once the liquids came to a simmer, I re-introduced the ribs back into the pot with some sprigs of thyme and then placed the pot in a 325 degree F. oven for 2.5 hours. After the ribs were done cooking I removed them from the pot and strained the cooking liquid into a pan. I began reducing the liquid for about 20 minutes until it formed a nice, thick, “sauce-like” consistency. Right before the sauce was done, I de-boned each rib and coated them with sauce. The meat ends up being extremely tender, literally just falling apart as you cut into it. 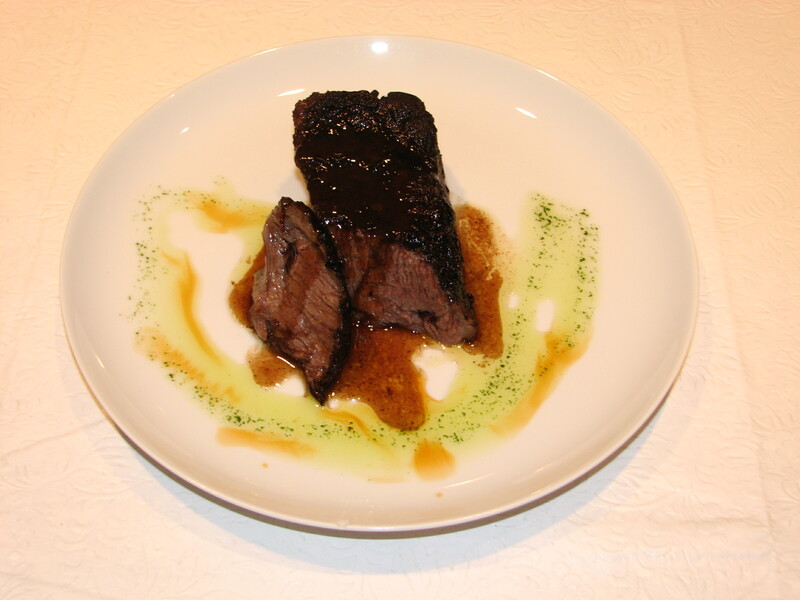 The natural flavor of the beef really shines through, and it’s a nice combination with red wine/stock reduction. I garnished the plate with a little cilantro oil to liven up the flavors and added a nice vibrant green color to the plate. All in all, I had a great experience cooking short ribs for the first time. 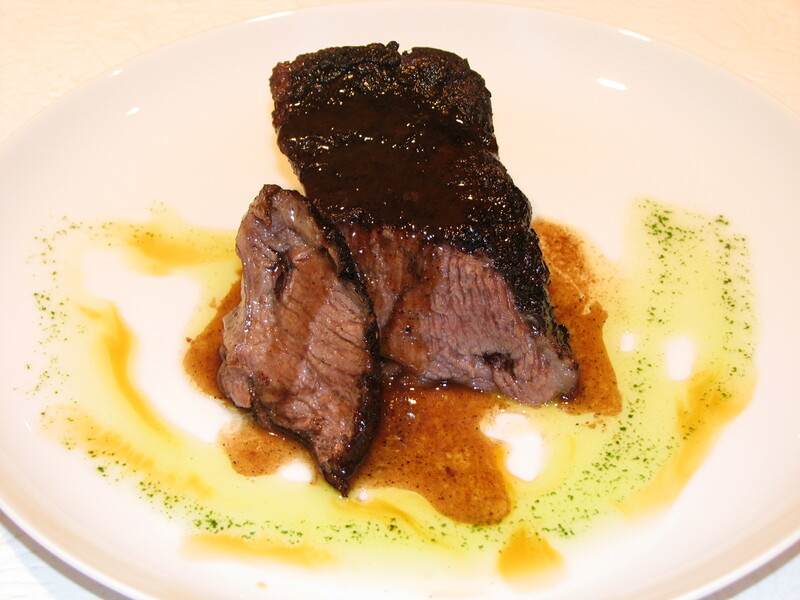 My other diners also really enjoyed the short ribs, commenting on how flavorful and tender they were. Although the total cooking time for short ribs is just about 3 hours, the result it totally worth it. Despite the numerous steps to making this dish, it is actually quite simple to do. Enjoy. Thank you very much for your support! Much appreciated. The short ribs blog caught my eye then my appetite. I work with your mom and enjoyed seeing your web site. The combination of dining reviews and home cooking recipes was very new and most interesting. I can tell you have a real passion for food. keep up the great work. Thank you very much Mike! I really appreciate your support for the blog, help spread the word if you can. I am going to post an article about Blue-Corn Crusted Crab Cakes, so stay tuned.